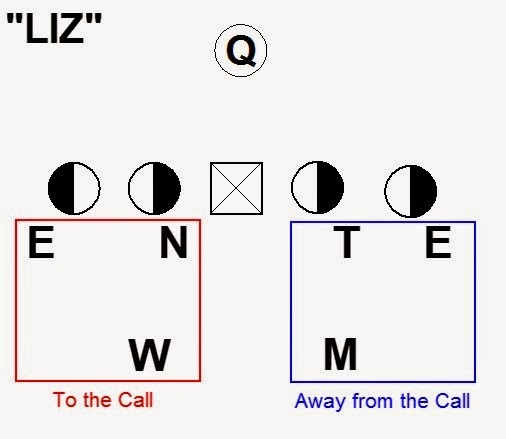 Here is a simple system to package and use one word calls for an adjustable pressure from a 3-4 defense. Having a system of one word calls is helpful when facing an up tempo offense. The call from the sideline is the name of an NHL team. 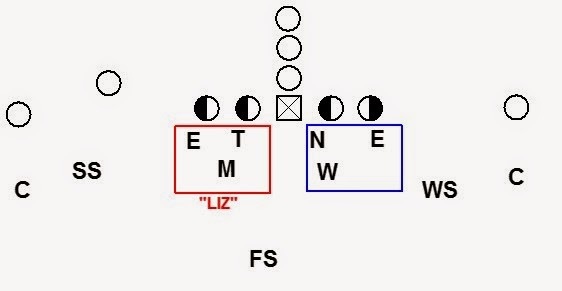 The team name tells the LB where to make the Right/Left call to set the blitz. 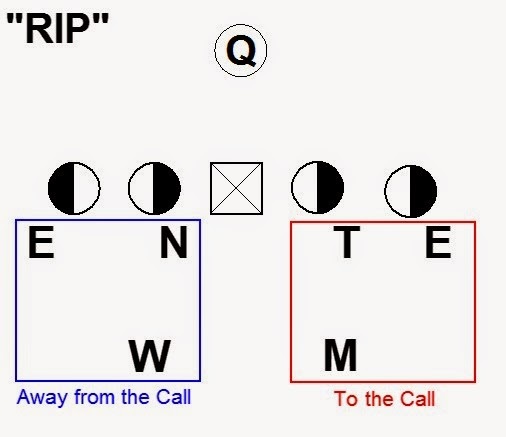 This system allows the defense to easily make the call with one word from the sideline and one word on the field. 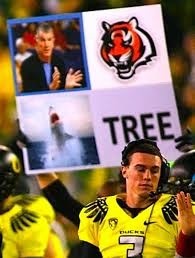 Because every call has a logo the defense can elect to use a poster board call system instead of using verbal calls. This is the first post in a series about Basics of the 4-2-5 Defense. Let me start with two disclaimers. I am going to try to use generic terminology when discussing the 4-2-5. There is no universal terminology in football. This series of posts is not comprehensive. 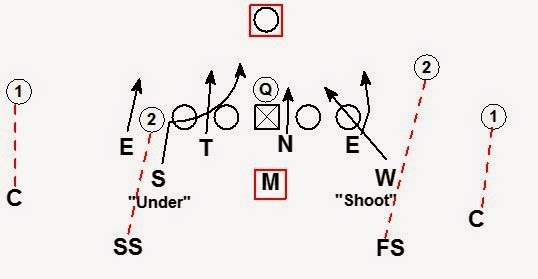 The terms, concepts, and schemes I am writing about will not cover every 4-2-5 scheme being run everywhere. So here we go. 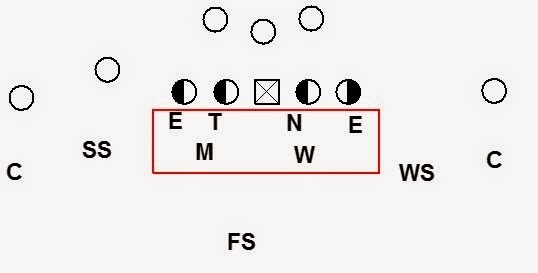 The 4-2-5 provides the platform to be multiple. 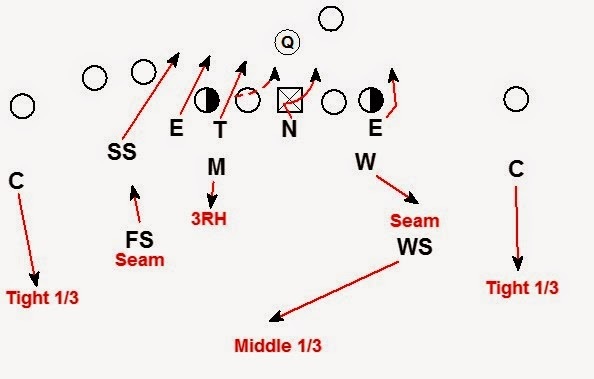 4-2-5 schemes have roots in 4-4, 4-3, and Nickel defenses. Combining elements from each scheme is what gives the 4-2-5 its versatility. 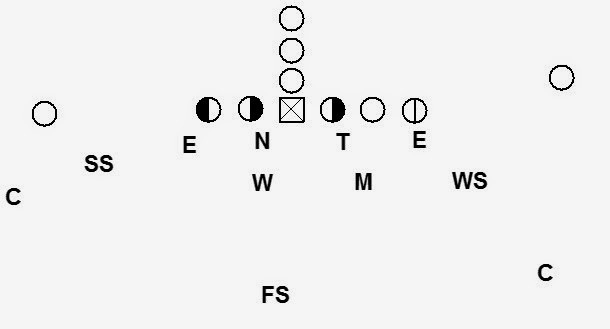 Drawing on the scheme’s nickel roots gives 4-2-5 teams the ability to run a divorced front concept. The idea is the front 6 align based on front alignment rules. 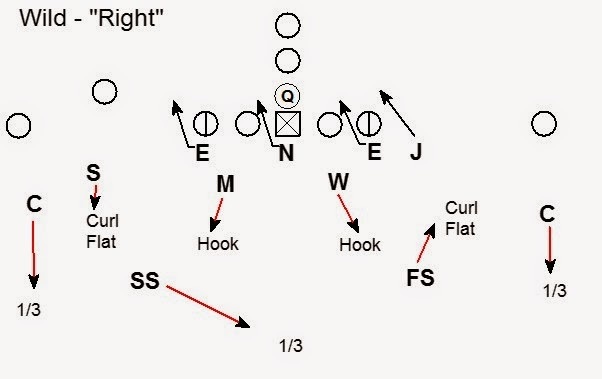 The DB’s align based on secondary alignment rules. 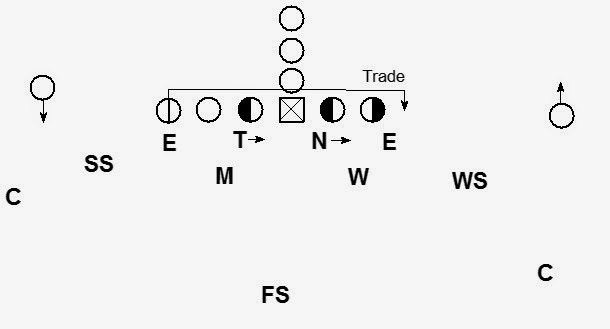 Because the front and defensive backs have independent alignment rules the front is “divorced” from the secondary. Looking at setting the front 6 defenders, there are a number of options. For the following discussion we are going to start with a basic front. This example is a G front with the DE's in 5 techniques, the DT in a 3, the Nose in a 2i, the Mike responsible for the A gap, and the Will responsible for the B gap. 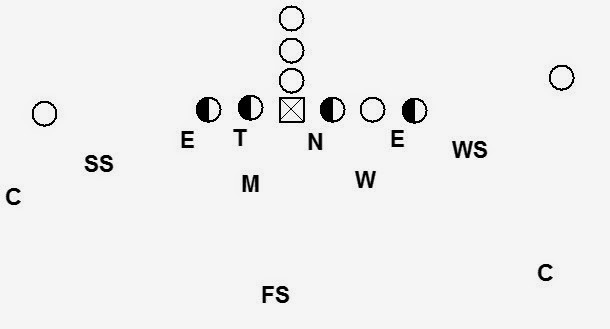 Getting the front lined up usually involves a LB making a declaration that tells the front where to go. Here the DE, DT, and Mike travel together and go to the call. 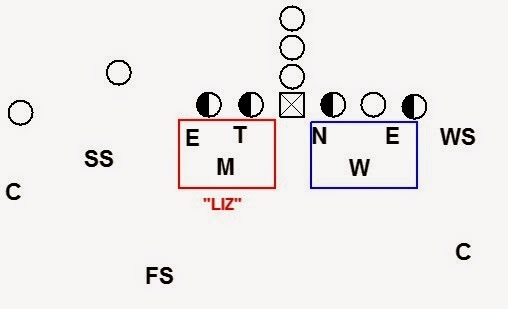 If the LB calls “Liz” those 3 players go to the left. The DE, Nose, and Will travel together and go away from the call. When the LB calls “Rip” the DE, DT, and Mike align to the right and the DE, Nose, and Will go to the left. This is certainly not the only way to do it. Some teams set the front based on the Nose. Here the DE, Nose, Will go to the call and the DE, DT, and Mike go away. I think this choice comes down to how the defensive coordinator thinks. 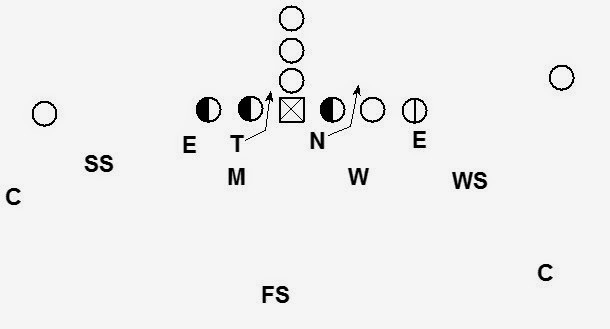 If the coordinator thinks about the front based on the 3 tech, it makes sense to set the front based on the 3. If the coordinator visualizes the defense based on the Nose, the front should get set based on the Nose. 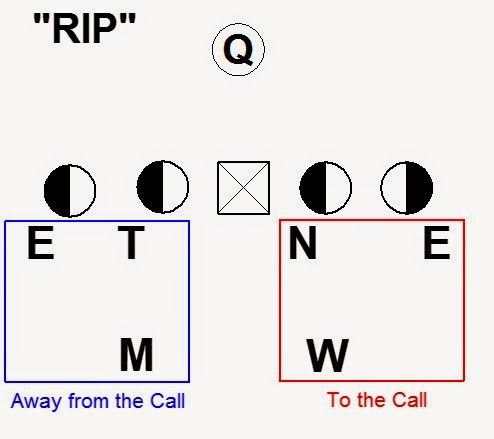 Another choice some defenses make is using a right and left DE instead of them traveling to and away from the call. 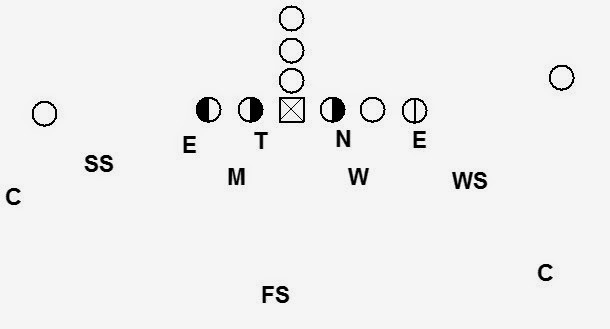 A Right and Left system is great for helping the DE’s get lined up. The DE’s know where they are going without a call. The DE’s also get to develop the consistency of stance, vision, and muscle memory from always being on the same side. The drawback of using right and left is the defense has less control over aligning the DE’s where they want them every time. Another consideration of Call/Away DE vs. Right/Left DE is the similarity of the players at those positions. If the DE’s on a team have similar profiles, a right/left system may be the way to go. If the DE’s have different profiles, the defense may want more control over where they are aligned. When it comes to setting the front the defense can have the LB set the front anywhere it wants. 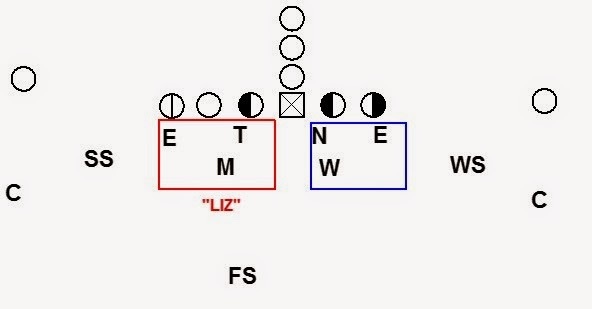 Strong - Make the Rip/Liz call to the pass strength (higher number of receivers). When setting the front strong/weak the defense must have a plan to deal with a balanced formation. 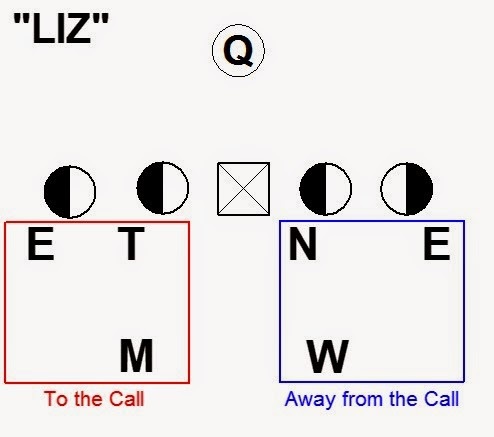 Boundary – Make the Rip/Liz call to the short side of the field. When setting the front Tite/Split the defense must have a plan to deal with when the offense flexes the TE. The defense must also have a plan to handle TE trade. There must also be rules to handle two TE’s sets. This could be an offset back in the shotgun or an offset fullback. The defense must consider what to call when there is no offset back (pistol or under center). Also the defense has to consider what to do against running back motion. 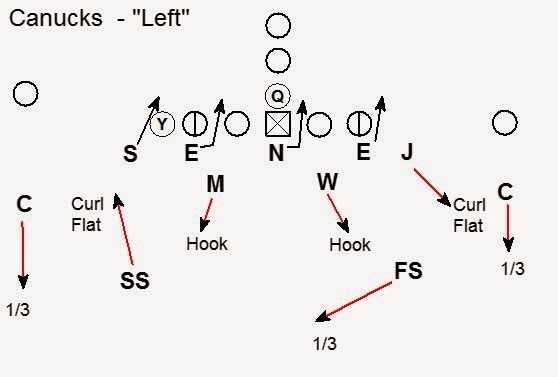 The defensive coordinator can set the front right or left. If there is another place the defense wants to set the front, all the defense needs is a word. Because the front is divorced from the coverage the defensive coordinator can get more from less. With one front (G) and one coverage (3) the defense has the flexibility of 10+ calls. These calls fall into 1 of 2 basic categories: guaranteed calls or conditional calls. Guaranteed calls like Field, Boundary, Rip, and Liz are going to be there no matter what the offense does. The conditional calls like Strong, Weak, Tite, Split, Heavy, and Lite are dependent on the how the offense aligns. When calling conditional calls the defense must have solutions for dealing with an offense who changes the condition after the defense has set the front. Take for example a 21 personnel team who has strong TE run tendencies. That may lead the defense to plan on setting the front Tite. If the offense trades the TE, how will the defense respond? Here are some of the options. Nothing – The defense has the ability to do nothing. The result is the defense ends up in the same look it would be in if the front had been set split. If when the TE trades the defense adjusts very little, it sends a powerful message to the offense. The offense is looking at how the defense reacts. 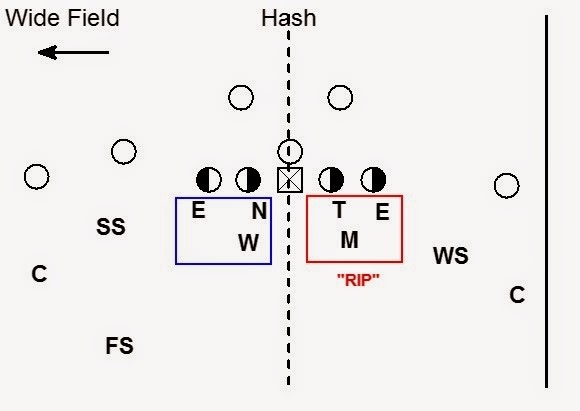 If the offense moves 1 player and the defense moves 6 in response, you can expect to see the offense continue to trade the TE trying to make 6 defenders move before every snap. If the defense doesn’t have many players moving on the trade, the offense may decide trading the TE is not worth their effort. 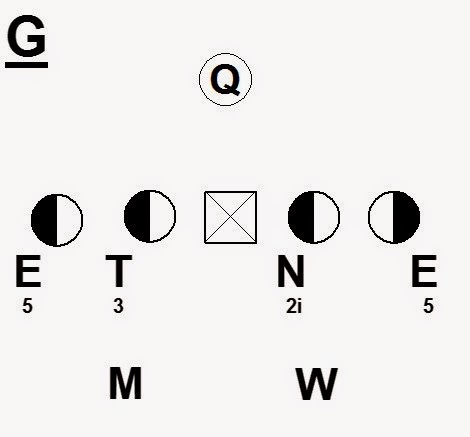 Reset – If the defense wants to get the front to the TE, the defense can reset the front. Here the original call is “Liz”. When the TE trades the LB makes a “Reset Rip” call. The Tackle and Nose switch and the Mike and Will switch. The DE’s stay on their side. It is often too far of a run to get the DE’s reset. The final result is the defense back to having the front set Tite. Resetting the front may not be fast enough to deal with the offense. 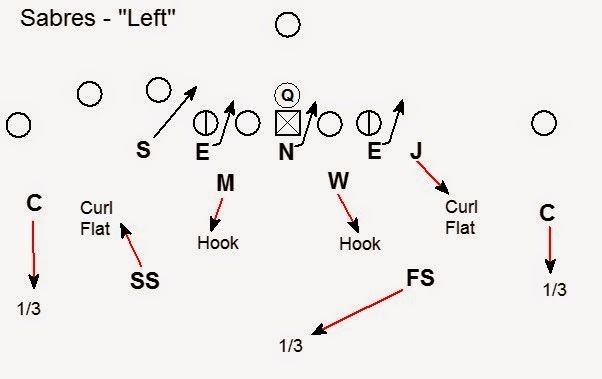 Slide – Slide is an option the defense can use that allows the defense to get a 3 technique to the TE in a different way. Here the LB calls “Slide” to the DL. This tells the Tackle and Nose to slide their alignments pre-snap. 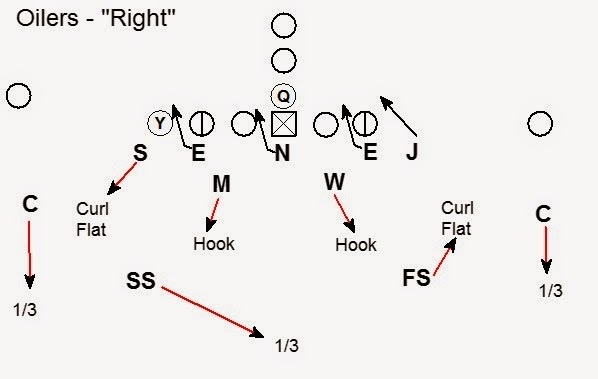 The Nose becomes a 3 technique, and the tackle becomes the 2i. The drawback of this solution is the Nose and Tackle now have to play new techniques. Also the Mike and Will have new run fits when the front is in a slide alignment. 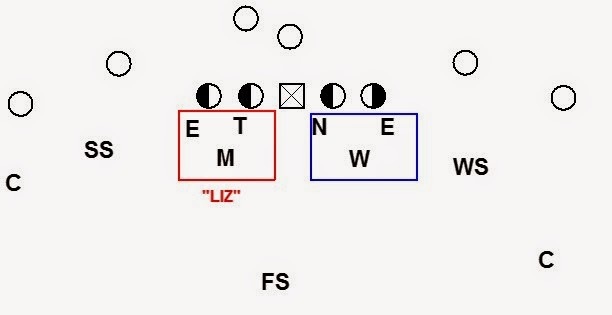 Slant – The DL can slant when the TE trades. Here the LB calls “Slant” when the TE trades. 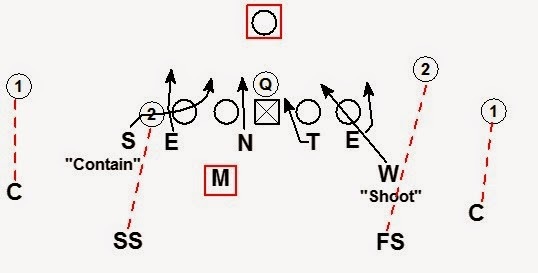 The Tackle and Nose slant post-snap which gets the defense back to a Tite front look. That is the basic concept of a divorced front. Not all 4-2-5 defenses run a divorced front this way. Not all 4-2-5 defenses choose to run a divorced front at all. Let me know if this similar to what you are running in the comments. If you do something different leave that in the comments too. Coach Jerry Gordon is the author of Coaching the Under Front Defense. 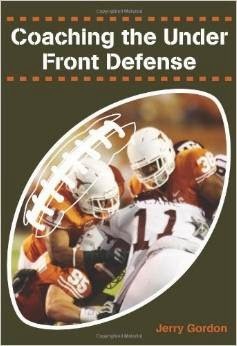 If you are interested in learning about the under front/defensive football, I highly recommend reading it. Coach Gordon has just launched a new website CoachJerryGordon.com. The book and ibook are available to order on the site. 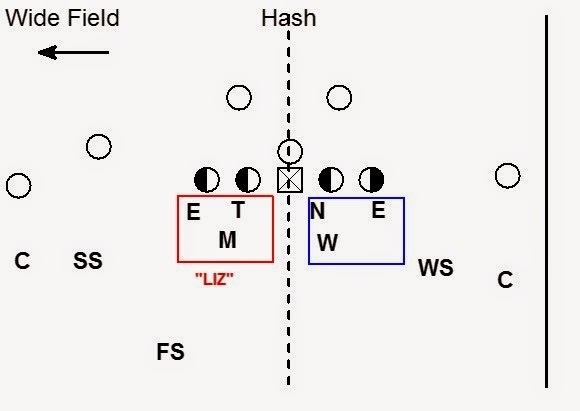 In the spirit of Coach Gordon’s new website, I thought I would feature a blitz the formation concept from the 4-3 defense. 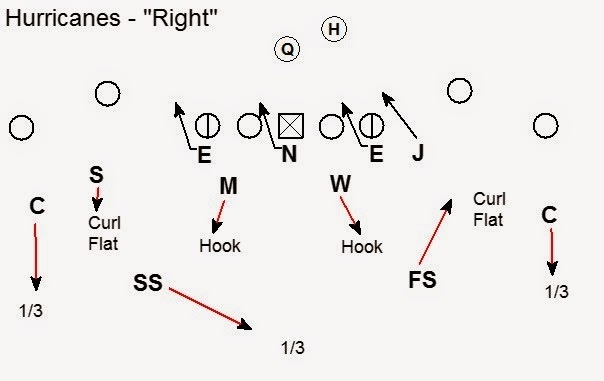 This blitz is from the 1996 Miami Hurricanes defensive playbook. 1996 was during the Butch Davis era at The U. 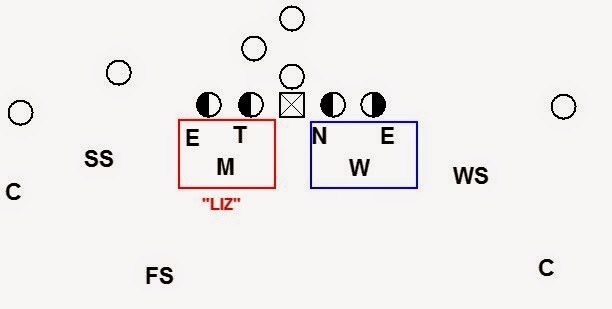 The blitz is a 6 man pressure that adjusts based on the backfield set. The coverage is cover zero man. The blitz was designed for personnel groups using a TE. Against the pass the Sam turns the shoot blitz into an under blitz. 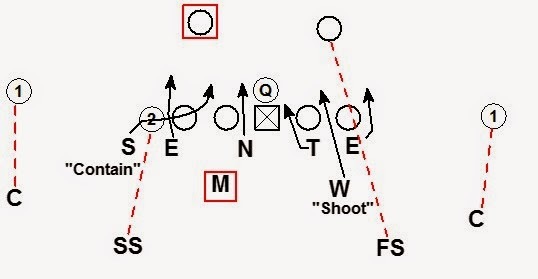 This concept provides a shoot blitz against the run to attack TE side run game. Against the pass the blitz converts to a pass rush blitz. The weak side crash blitz by the Will is good vs. split end side runs. Will widen alignment to the formation. The complement to the Canes Check Blitz is the Eagle Check Blitz. 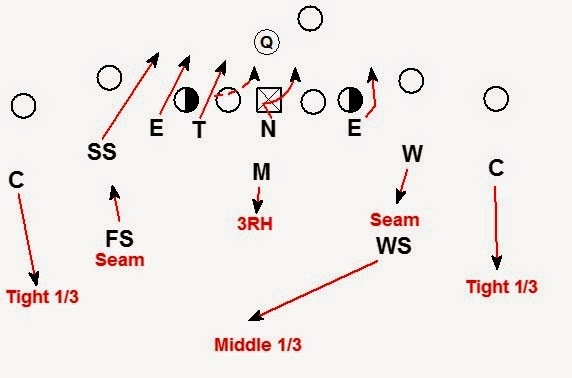 This post is a follow up to the Simple Adjustable 4-2-5 Zone Blitz post. 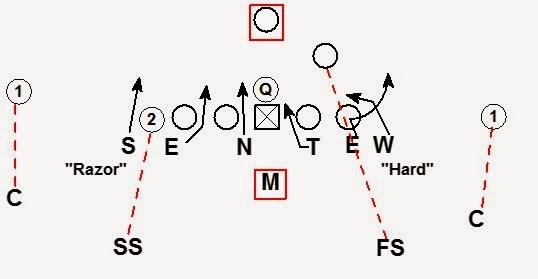 This blitz is designed to overload the pass protection to the field. The coverage is the same fire zone concept used in the Boss blitz from the previous post. The coverage does not need to be checked vs. a 3x1 formation. The Mike does need to widen his alignment. The Will can cheat his alignment closer to the box. Get off the ball on straight line track to the QB. If there is daylight, stay on your track. If the daylight is gone work a move to the inside to find new daylight. If the OL inside (here the OG) blocks down there is daylight. Stay on your track. If the guard sets wide there is daylight. Stay on your track. First step at 45 degrees. Attack edge of OL then work to opposite side of OL. Side to side action like a windshield wiper. When the offense is using a slide protection to the field. This is the protection we are hoping to see. The width of the SS, DE, and DT force the offensive linemen to set deep and to block in open space. Here the OT sets to the SS and the OG sets to the DE. The wiper technique by the Nose is designed to create hesitation by the Center. The DT has daylight and stays on his track. The Center has a very difficult task to set late to a DT on a straight line run to the QB. Here the OT sets to the SS and the OG sets the DT. The End has daylight and will stay on this track. 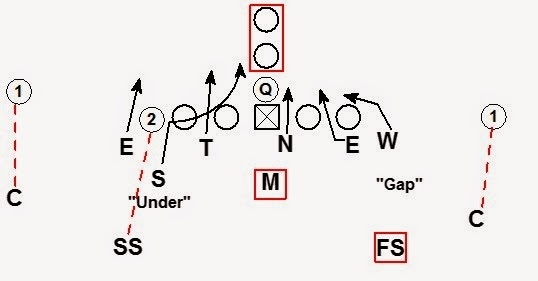 The DT does not have daylight and will work a move to the inside. The End should get a straight line run to the QB. 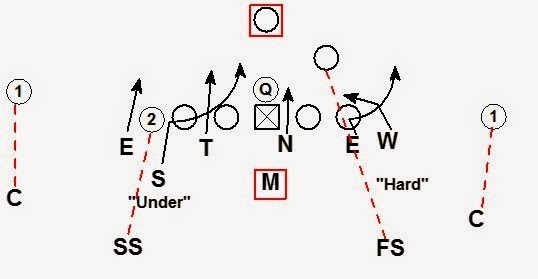 Here the OT sets to the DE and the OG sets to the DT. The SS should have the straight line run to the QB. Both the DE and DT have a blocker on their track. Both will work an inside move to find new daylight. Here the Center is aggressively sliding and ignoring the Nose on the wiper. The Nose will stay on his initial path. This will take him as far from the OG as possible. This block is very difficult for the guard. 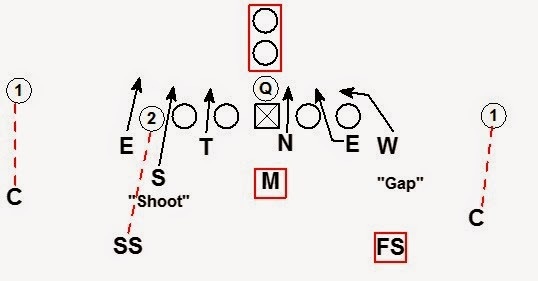 When the RB is aligned to the field the Nose will change his technique from wiper to a normal slant to the away A gap. We are expecting the slide of the OL is going to the boundary in this situation. The OT has the DE man to man, the OG has the DT, and the Center has the Nose. The OG and OT to the right are sliding. We want the Nose to slant instead of wiper to create space for the DT and DE to the blitz. Both the daylight rushers have a blocker on their track. Both will work a move to the inside to find new daylight. We expect our DL to win these 1 on 1 matchups in open space. Our changeup is to switch the job of the DE to contain and allow the SS to be a daylight rusher. The SS will align with inside foot back. His 1st step is with his inside foot up the field. His 2nd step is with is outside foot up the field. The SS should plant on the 2nd step and get on his track. 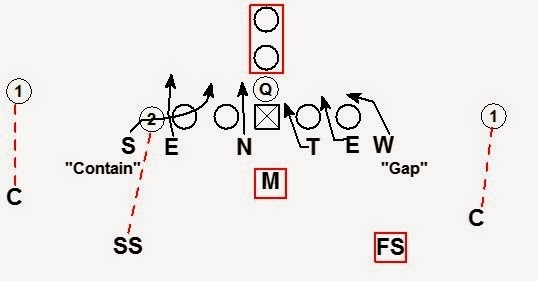 When we call this blitz we allow the SS to call the rush at the LOS. The SS will tell the DE who has contain with a "You" or "Me" call.